“No” is one of the hardest words to say. Why? We like to be liked, and a “no” can be disappointing to others. We want to be positive, and “no” comes across as negative. We are afraid of missing out on great opportunities. However, if we don’t say this word enough, we can end up disillusioned, disappointed or exhausted. Angelica was able to discern pretty quickly whether my request would fit into her current season of life. That tells me she was keeping an informed perspective of her opinions, commitments and relationships. She gave an immediate answer. Angelica didn’t hesitate or string me along. It made the outcome quick and relatively painless. That’s not to say that we should always answer quickly. It’s completely appropriate to tell someone you want to think about it, IF you give them the courtesy of a self-imposed deadline. For example, she could have said, “I’d like to think about this. Can I give you my answer Friday?” and then be sure to give the answer on Friday or before. It wasn’t necessary in this case because of her confidence in her decision, but if she needed a little time, that would have been fine. Angelica understood that it is an honor to be invited to participate in an event or project. The requester is somewhat vulnerable when extending the invitation, risking rejection. By saying “thank you” she acknowledged that she appreciated being considered, which softens any possibility of coming across as rejecting the person doing the inviting. She didn’t give an explanation. Angelica gave a simple “No, thank you.” She did not feel compelled to explain or rationalize her decision. I admire that. I tend to provide more information than necessary and would do well to just provide a simple answer more often. 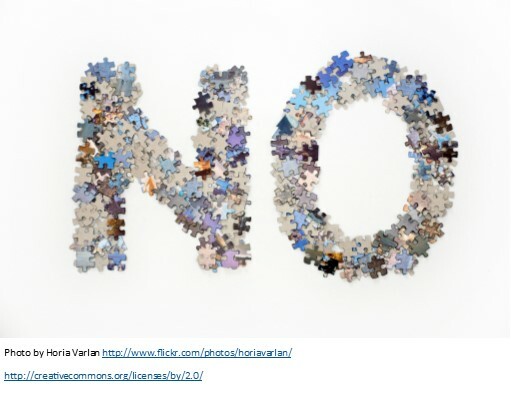 “No” isn’t easy to say, but it often makes your life easier!